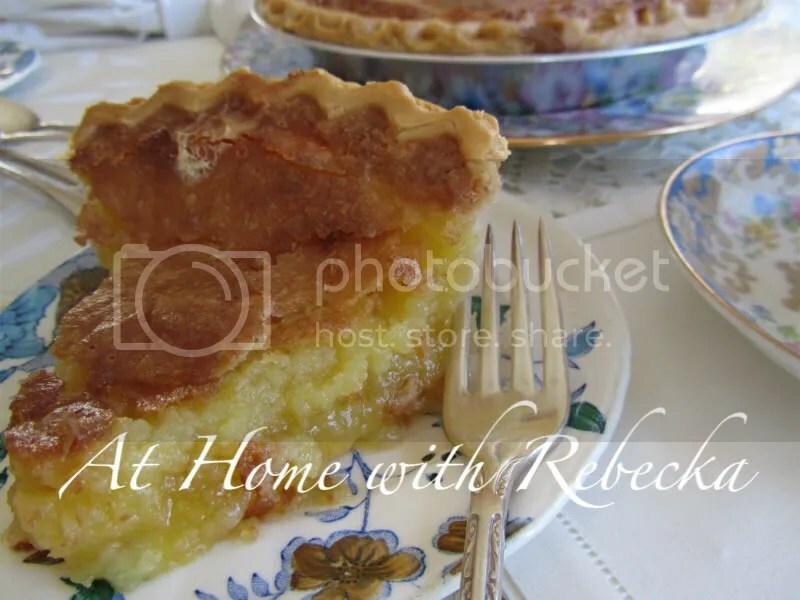 I’ve tried to re-create the Butter Chess Pie recipe from Furr’s Cafeteria for years! I’ve come close but never met the standard for the creamy, rich flavor of the original recipe. Furr’s recipe is the perfect slice of heaven; gooey yet creamy, and just the right amount of sweetness to balance the custard texture. I’ve tried hundreds of recipes over the years, making two new versions this week. Both recipes boasted their incredible likeness to the Furr’s recipe but they both ended up in the trash! One pie was literally in the oven for two and a half hours and never set up. Nasty! This is my third recipe this week, tasty but not the real deal! I recently learned that Furr’s will not divulge the recipe come hell or high water! So if one of my fellow food bloggers knows the “real” recipe for this luscious dessert please feel free to share! Make crust using an electric mixer, beat cream cheese and butter until well combined. Add flour and mix until dough forms a ball. Pat into a 9 inch pie pan. Chill. The Furr’s recipe has a cool yellow crust. Mine always end up with this crunchy brown top. I’ve tried covering the pie with foil but still no luck. Despite the crusty top this recipe was pretty good. I’m still hoping to find the secret recipe for the Furr’s pie. Until then, I’ll continue to post my valiant efforts in the quest to find the perfect Butter Chess Pie recipe. I too have tried every copycat Furr’s chess pie recipe. None of them compare. 🙁 I have even tried ones with cornmeal. Nothing is the same as their. Luckily, after closing down so many Furr’s, they have started to open back up new locations in my area. I can pick one up whenever I want to. Definitely what I ask for my birthday instead of cake! Jennifer, you’re so lucky to have Furr ‘s opening up close to you, what i wouldn’t give to have a slice of that delicious pie right now. The closest Furrs to me is 40 min drive and their pie was a pale comparison to what i remember. Thanks for visiting my blog, if you ever come across a stellar recipe, please pass it along! My college roommate made a chess pie that included cornmeal in the filling. It floated to the top to add to the sugary crust on top of the filling. I have been trying to find a recipe for their coconut meringue pie. What they serve now tastes like they bought a Mrs Smith’s and thawed it. Mr Furr would be turning in his grave if he saw it. Doesn’t even have the meringue..has coolwhip. Their crust was the best I ever had and never could figure out, but always thought they coated it with sugar before adding filling because the crust had a sweeter taste than others. Melissa, with almost all of the Furr’s restaurants closed I’m not sure why the company won’t release the original recipe. I’m sure there are hundreds, even thousands of people who would love to have it. What I can’t recreate is the sweet tender crust as you mentioned. I’m betting the recipe is super simple but has either a secret ingredient or method that creates the perfect pie I remember. A chef friend was visiting a restaurant here in Lubbock and saw the Furr’s cookbook in the back room. He said it was huge. We keep meaning to go by and see if they still have it there. There is a new pie place that makes the Millionaire like Furr’s used to make it. The ones now lack the richness. I think they use margarine and coolwhip. A friend makes the best chess I ever had, but he moved away. I sent him some messages on FB, but her never responds. I wish I had that cookbook Melissa! I also hope your friend gets a hold of you with the recipe you loved so much. I’m dying to try it! Thanks so much for visiting and leaving a comment. I’m sorry it’s taken me so long to respond! Is this similar to the pie they make that has just a bit of chocolate on top of the creamy buttery filling? I had no idea what the name of it was. Hi Tori, I think the pie you are referring to is one that I’ve had at Furr’s called German Chocolate Pie. It has a similar filling to the Chess pie and a crunch top. It’s worth trying the recipe below to see if it’s what you’re remembering. Thanks for visiting! Sorry it’s taken me so long to get back to you! I’ve moved to Word Press and no longer get notifications on older posts! 1.In a medium saucepan, combine the 1/3 cup sugar and the cornstarch. Stir in the milk, chocolate, and 1 tablespoon butter or margarine. Cook and stir till thickened and bubbly. Reduce heat; cook and stir 2 minutes more. 2.Gradually stir about 1 cup of mixture into egg yolks. Return mixture to saucepan; bring to boiling. Cook and stir 2 minutes more. Stir in vanilla. 3.Turn the hot pie filling into the baked pie shell. 4.In another saucepan, combine the beaten egg, evaporated milk, the 1/2 cup sugar, and 1/4 cup butter or margarine. Cook and stir over medium heat just till the mixture is thickened and bubbly. Stir in the coconut and pecans. 5.Spread the pecan mixture evenly over the chocolate filling. Cool the pie on a wire rack; chill thoroughly. I just stopped by my old post and found your feature for this recipe!! Thank you for the honor! Thanks for checking on my site load time Carol!! I'll go look at you buttons right now!